Don't miss free music from Josh Hoyer and Soul Colossal in the Cinnabar on Tuesday, February 20th, Wednesday, February 21st, and Thursday, February 22nd from 3:30 pm - 6:00 pm. Josh Hoyer and Soul Colossal will be filling the Cinnabar with soul and some R&B tunes. See full season music line-up here. Josh Hoyer & Soul Colossal’s combination of soul, funk, and R&B is in a word, electric. Best displayed in their high-energy live show, the blend of Hoyer’s honest lyrics and his soulful (sometimes in-your-face) vocals merge with his top-notch band to create an undeniable chemistry. Hoyer formed Josh Hoyer and Soul Colossal in 2012 in famed blues town Lincoln, Nebraska. The award-winning six-piece band includes some of the area’s most revered and accomplished musicians. Inspired by Stax, Motown, New Orleans, Philly and San Francisco, the band continuously crosses musical boundaries both in style and era and joins forces each show with a common goal – to have the crowd dancing so much they forget even their smallest troubles. 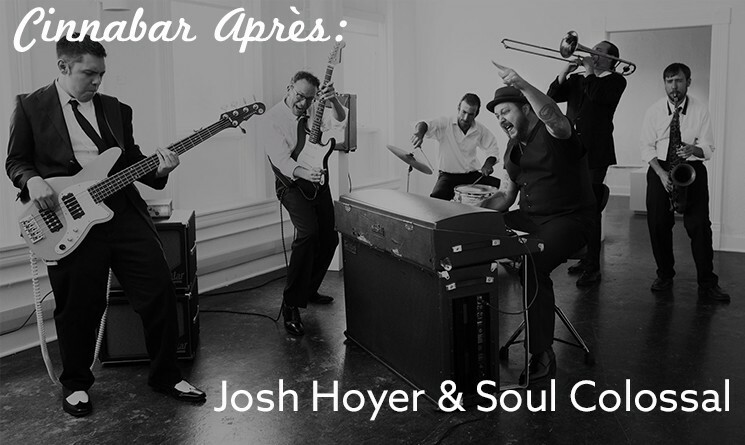 Josh Hoyer and Soul Colossal is a powerfully authentic & original Soul/Funk band whose mission is to empower and encourage people to fight the good fight.